No evening service apart from Sacrament at 6.30 pm on the 3rd Sunday of the month. Our city-centre church is a diverse community of worshippers with links to many countries. 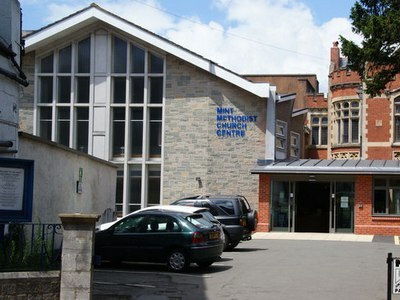 It is also the meeting point for a flourishing Korean congregation with its own language service. It joins English speakers for Communion and united services. 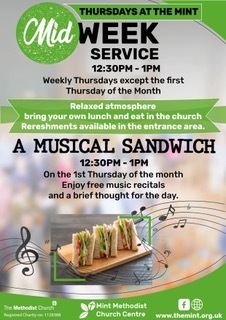 A new venture is ‘Thursdays at the Mint’, a midweek service 12.30 – 13.00, except the first Thursday of the month when it is ‘A Musical Sandwich’ at the same time. Details may be found on this Flyer. We are an open and inclusive community of varied theologies and lifestyles which values thoughtful challenging preaching in both traditional and contemporary worship supported by a strong musical tradition and standards. The Mint has extensive premises open weekdays 9.45 a.m. – 9.30 p.m. and welcomes members and visitors for prayer, communion and support. 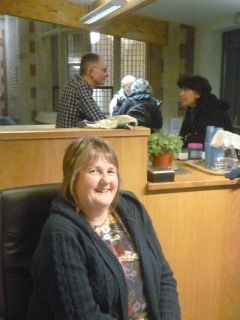 Chris Ware, pictured, is the Mint Centre Facilitator who provides a warm welcome to all who come through the doors. The Reception Desk is staffed 9.45 am to 9.30 pm – weekdays. 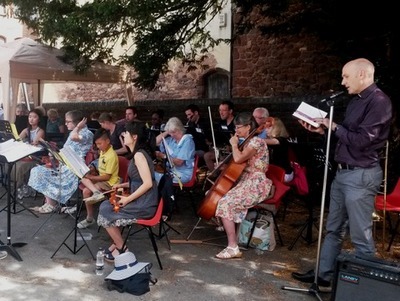 Church activities include Young Church, numerous fellowship and social groups including:- Tuesday Fellowship for seniors; Prayer Group; University Chaplaincy Church; and a venue for the Exeter Interfaith Group and Exeter Food Bank. Toddlers, young children and parents meet each term time Friday morning at the Mint for activities and fun. 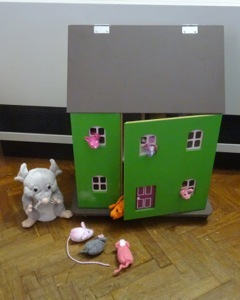 This is Matthew and the church mice, who they meet in church. In addition more than 40 Community Groups are welcomed into the buildings offering a range of activities including Exeter Society for the Blind: yoga and U3A lectures. On Sunday 22nd July 2018, The Mint held an Outdoor Songs of Praise. Fore Street was closed to traffic as the shopkeepers occasionally come out onto the street to hold a Flea Market. The orchestra (of all ages and grades) played 9 hymns and Rev Steve Santry joined in with his trombone and read parts of Mark’s gospel. It was wonderful to be part of the local community in the sunshine. The Mint’s Charity of the year is Rural Mission and we are fundraising with a treasure hunt, and various social events including a picnic and a barn dance. The funds raised will support Andy Jerrard in his work with isolated agricultural workers in the district. Find out more here.